About the NPC – Alumnae Panhellenic of Tallahassee, Inc. The shield is a protective influence for our entire membership. A lamp denotes leadership, scholarship and enlightenment. The laurel wreath signifies victory, or achievement of ideals.While the sword piercing the wreath indicates willingness to fight for ideals, symbolizing, too, penalty of obligation; also bravery, achievement and discipline. The mantling surrounding the shield is the protecting cloak that education gives us, and a protective influence of organization. 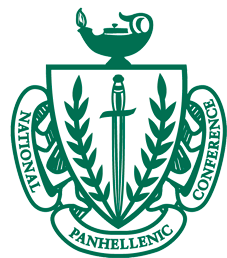 Thus there in the mantle is inscribed the name of the National Panhellenic Conference.